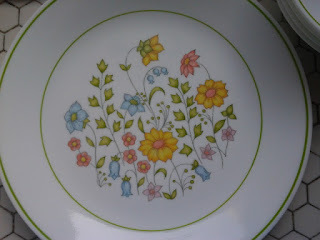 Treasures My Husband Hates: Corelle Wildflower?Meadow? 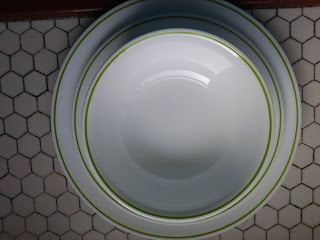 For our wedding almost 5 years ago we got a nice thick, heavy, easily broken dish set from a big retailer. They are white and square. The salad plates have paisley's on them. The bowls are square. The are heavy. Did I mention they chip easily. I really hate those things. THM cannot drink the milk from is cereal. He cannot carry his dinner plate to the sink. They have to leave my house. And that is what they did. I sold them at my yard sale. 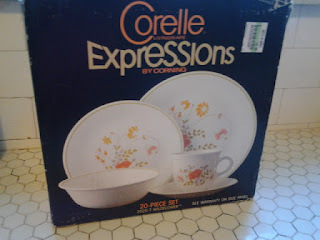 I found a brand new in box set of Corelle dishes at... Yup you guessed it. Salvation Army. I love the pattern. They are called Wildflower. They go perfectly with my vintage table linens. And they don't shatter when dropped, THM can easily carry them to the sink and he can drink the sugary goodness from the cereal. I hesitated opening them. Never used, never seen the outside of the box. It is a vintage loves dream. 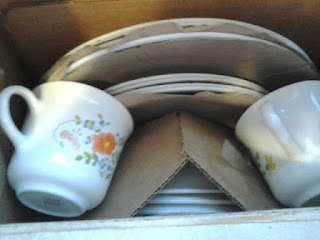 Did you know some people won't even open up vintage Pyrex boxes ever? The whole sealed box is a huge thing. They sat around for 3 weeks before one weekend I grabbed the camera. 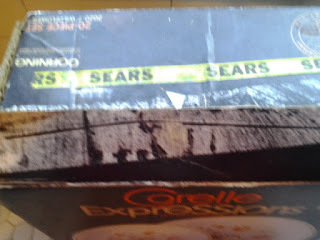 I only got the box pictures. So they sat around for another few weeks. I wanted to use them for my Birthday. So I started by getting the cups out. Then I pulled a plate out. WHAT? WAIT! What are these? These are NOT the pattern on the box. I pulled out more plates. All the same odd pattern. The big and small plates have this pattern. I double checked with THH that the box was sealed. Did someone just put the different plates in there? And the box resealed from sitting so long? But all the brown paper was in it. and when I got them all out the little replacement paper was still in the box. So who knows what happened. Everything except the cups and box match. Well the cups and box match each other. Good thing I like the plates. And anyways I don't ever use tea cups.Oh the joys of boxed stuff when you don't open in the store. But that is the fun of it right? The plates are Meadow. Came out in 1977. Hey at least they are summer/spring right? and not from the 80s. Still happy with my $10 purchase.